Not everyone needs to spend a couple of weeks earning their sea legs to feel at home. 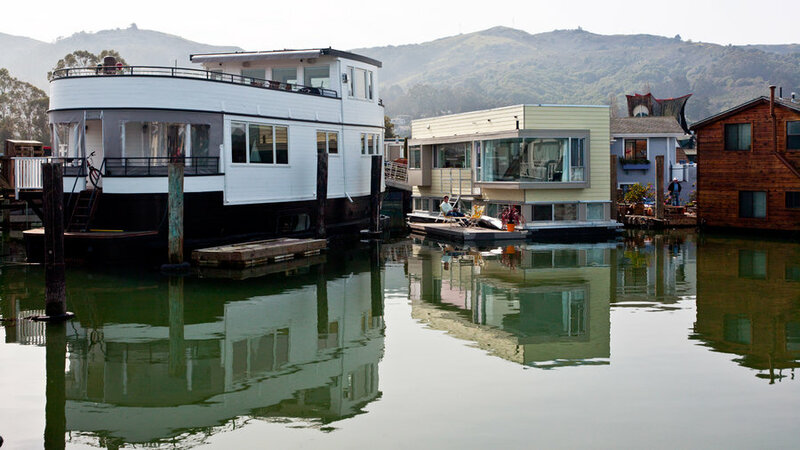 But that’s what happened to Matt and Jennifer Harvey in January 2009, when they moved into a 1,000-square-foot modern prefab houseboat on California’s Richardson Bay with their children, Jack and Grace (now 4 and 20 months). 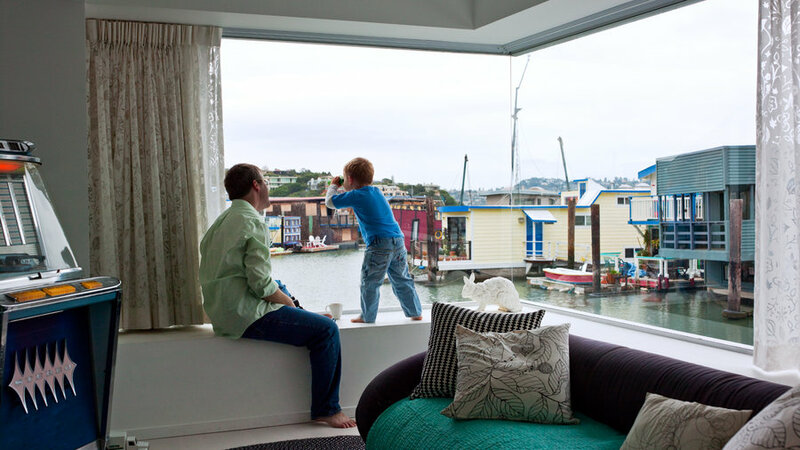 Matt and Jack enjoy aquarium-like views from the living room window. 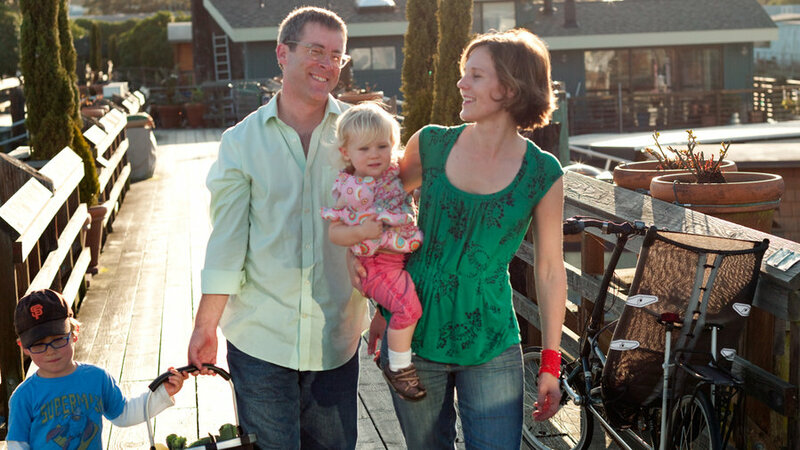 The Harveys live by the tide charts, their plans dictated by the bay’s water-level rise times throughout the day. Jennifer and Grace check for mail at the head of their dock, the neighborhood hub. 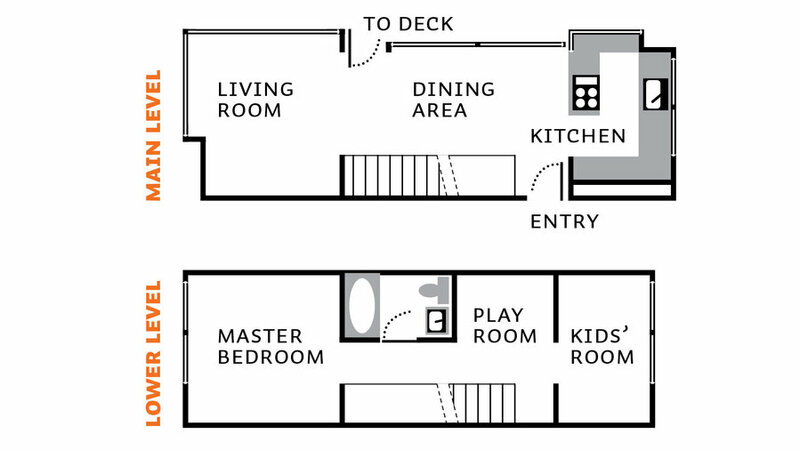 A super-efficient kitchen means meals run smoothly. Everything from the outside world must be carried in or, more often, wheeled in via repurposed shopping carts from the marina parking. 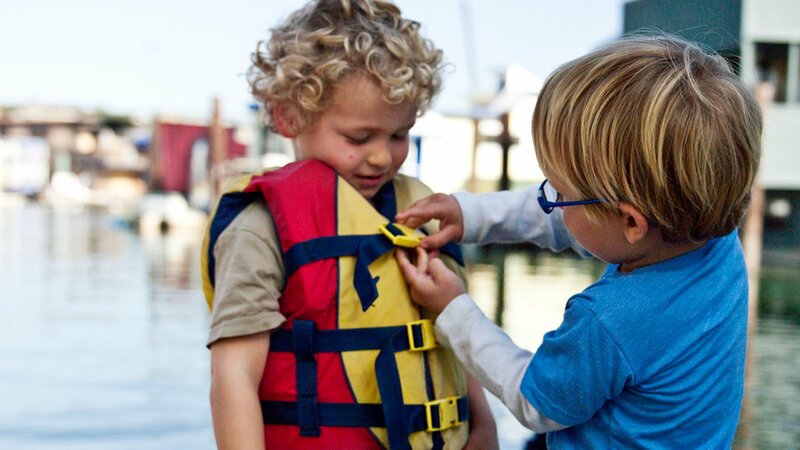 Jack thinks it’s totally normal that his best friend arrives by boat for a get-together. Matt and Jennifer enjoy after-dinner escapes on the water near dusk—one of their favorite times of day. 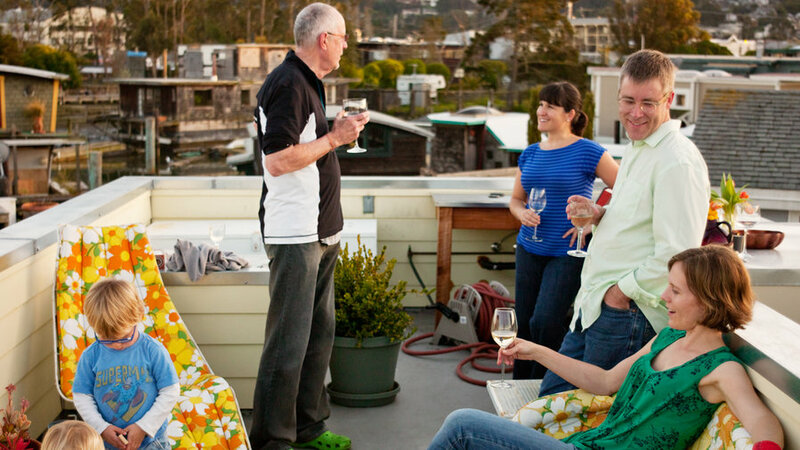 With friends close by, impromptu gatherings are the rule. Be strict about capacity. 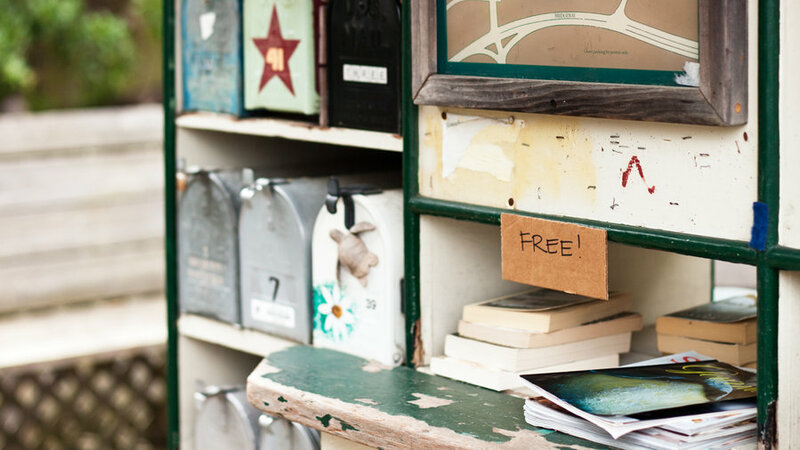 Reach a point of equilibrium with your stuff and stick with it. “Our kids know when they get a new thing, they have to say goodbye to something else,” says Matt. Store it where you use it. 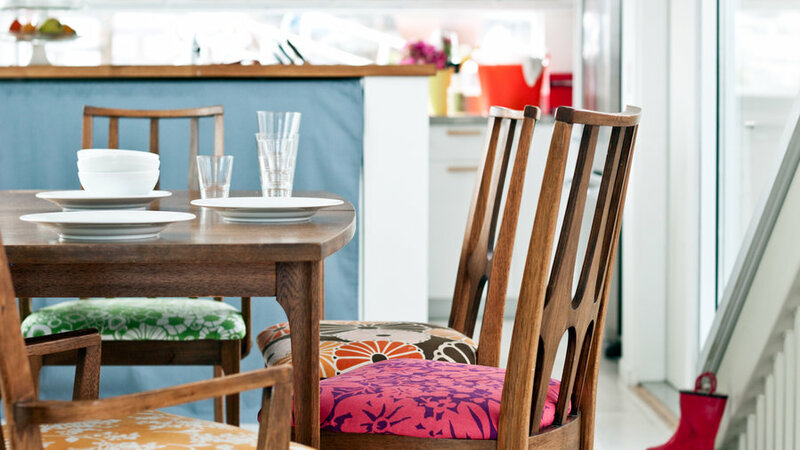 In the kitchen, oven mitts and spatulas are to the right of the stove, and the blender and mixer reside on the countertop where Jennifer bakes. Sausalito, CA: You can wander the docks anchoring the 300 or so floating houses at Kappas Marina and Waldo Point Harbor whenever you like. But an annual home tour (next tour Sep 25; check floatinghomes.org for more info) lets you step inside up to 20 front doors. 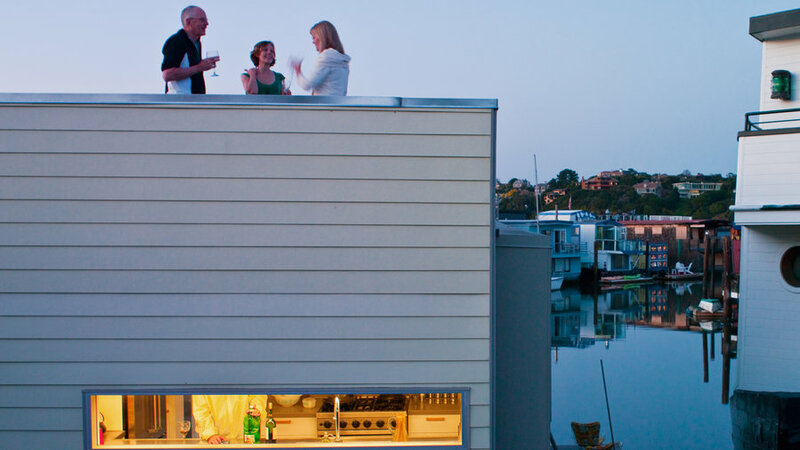 Seattle: More than 500 homes float on Lake Union and Portage Bay. 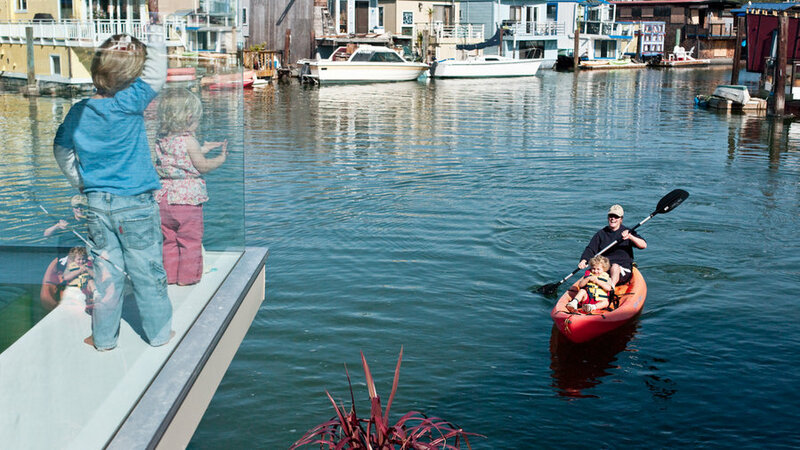 The docks are off-limits—except for the annual tour (Sep 12; $25; seattlefloatinghomes.org), when you’re welcome to look inside about a dozen homes. Always open? The waterways surrounding the homes. 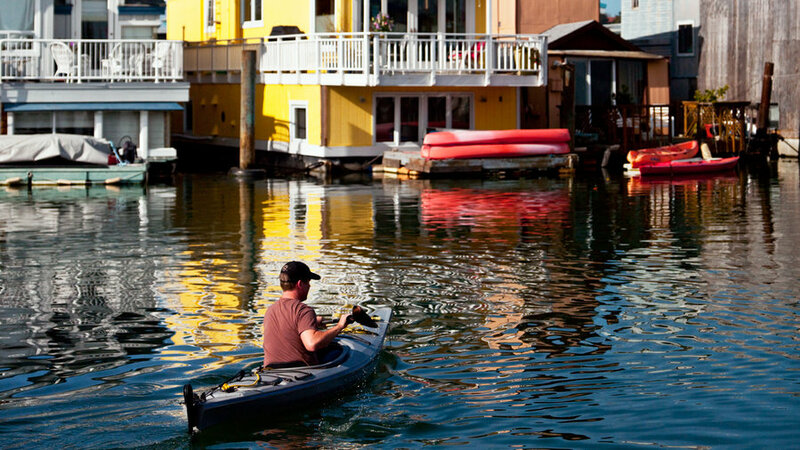 Rent a kayak at Northwest Outdoor Center (from $13 per hour; 206/281-9694).